In Catholicism, a great deal of emphasis is placed on the rituals surrounding the events of the Lord Jesus’s life from birth to resurrection to death. Every detail is minutely scrutinized and carefully celebrated in its own way. One such celebration is the Baptism of the Lord, which is celebrated in January every year. 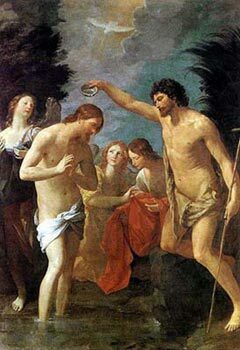 The Baptism of Christ would seem to be a paradox, since in Catholicism baptism is meant for remission of past sins and Christ was said to be born without Original Sin. However, by humbling himself, the Son of God, to John the Baptist, Christ is seen to have been taking on the sins of others and giving his followers a model to replicate – it was necessary not for him, but for mankind. After the Epiphany, which is seen as the “first manifestation” of the Lord, the Baptism is the “second manifestation” which marks the beginning of Christ’s public ministrations. The day is marked by feasting by Catholics, with a particular liturgy or set of prayers being read. Pope John Paul III began a tradition of christening babies at the Sistine Chapel on this day. Around the world, different water-centered traditions exist, such as in Ukraine, where craftsmen’s fairs are held with traditional food, drinks and entertainment and devout Catholics bathe in ice-cold lake water. Across southern and eastern Europe, orthodox believers jump into frigid water to retrieve a wooden crucifix that is thrown in. In Bulgaria and Romania also, similar traditions are followed. From pulpits, through publications and all forms of outreach, the Catholic Church uses this day to affirm belief in Christ and the importance of the rituals of Catholicism even in the modern day context of multiple fractions in Christianity and growing atheism. Practicing Catholics take this day as an opportunity to remember their own baptisms, and reaffirm what they see as their baptismal calling – to announce the goodness of their lord.